Pasquale Bpuni. Body and Soul.On the stand Pasquale Bruni tasting Italian dishes and jewelry. On the stand Pasquale Bruni tasting Italian dishes and jewelry. Delicious homemade food and comfortable decorating. Things Pasquale Bruni – an extravagant, three-dimensional, unusual, apparently, did not nosibelnye – always sit well. Pasquale Bruni – master inside out. Like a good tailor, he understands that the quality of a thing is determined by how processed it is not seen. The reverse side of the moon it is absolutely flawless. 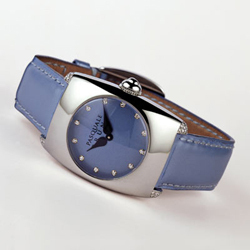 Jewelry shows a constant model of Pasquale Bruni. Tall, tanned, slim, beautiful, Russian … Though on the last note, it does not show. The premiere of this year – a massive jewelery with aquamarines (the largest – 40 carats), under which is hidden “sekretik”: diamond pattern from the collection “Garland” – look at her magic. Another one hit – a piece of crumpled tissue diamond on her finger. 940 diamonds, a total of 15 carats and 60 grams of gold. Put on – and not feel a moment. Called Anima – the soul. And the rest of the names of the collections are worth! “Heaven” – a soaring and shimmering in the air and the stars of the month, “Heaven” – with wings, “Star Ocean” – on a necklace like stars have gathered, reflected in the ocean, “the Garden of Eden”, with the magical colors of unknown flowers. And long, very feminine earrings, lots of fancy crosses made in the style of different collections of Pasquale Bruni, bracelets pendants with funny – a girl, boy, bird, airplane, apple, fish. I ask: why all presented with a collection of diamonds? 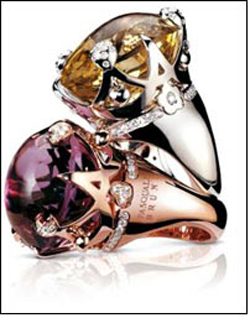 Pasquale Bruni fell out of love colored stones? No – answer me. Just preparing for the exhibition are more expensive and representative items. A colored stones have not gone away. , Pasquale Bruni has a new advertising image – a black Senegalese beauty. Monochrome minimalism, created by nature, and the sparkling diamond luxury born of man. But no matter what we tried to convey to the campaign Pasquale Bruni, she once bought a jewelry designer, she wants to dive into this union of body and mind from time to time.